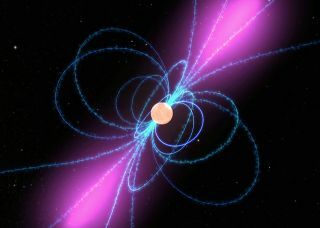 An artist's illustration of a pulsar, a fast-spinning neutron star that fires off powerful beacons of light. Scientists have found two strange pulsars that seem to perform a "cosmic vanishing act." GRAPEVINE, Texas — Two weird pulsars serve as extremely powerful and accurate cosmic clocks — some of the time. "When they're on, they're not particularly dim — you wouldn't know that they have this dual personality," said Kaspi, who is also the principal investigator of the Arecibo Observatory's PALFA survey, which first identified the pulsars. She presented the results yesterday (Jan. 4) here at the 229th meeting of the American Astronomical Society. "Beams of light — and, in most cases, for neutron stars' radio waves — come out of the magnetic poles, and you see one flash of this light each time the star rotates, like a little cosmic lighthouse," Kaspi said. "There's something like 2,500 of these pulsars known in the Milky Way, and they're well known for being excellent clocks, which enable all sorts of different astrophysical experiments to be done." Most pulsars broadcast continuously, but the PALFA team — and astronomers at the University of Manchester's Jodrell Bank Observatory in the U.K. who followed up on the discoveries — found that these so-called "part-time" pulsars released radio waves only 30 percent and 0.8 percent of the time, respectively. (About a year ago, the second pulsar abruptly changed to emitting radio waves 16 percent of the time, Kaspi said.) Three additional pulsars that turn on and off intermittently are known to exist, but the others all spend more time on than off, the researchers said in a statement.